My friend, Karen Salmansohn, author, personality, and satellite radio jock has a great interview show on the Lime channel on Sirius called, Be Happy Dammit. Take some time and treat yourself to a few of her episodes in podcast form. I’ve been in the studio with her a couple of times–she’s very smart and very entertaining. The tagline on her blog is, “Self Help for People Who Wouldn’t be Caught Dead Reading Self Help.” If that doesn’t make you want to read her stuff, then I don’t know what will. And she’s sold more than a million books, so she’s written a whole boatload of stuff. 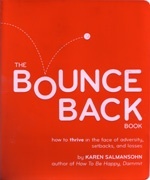 Karen’s written a new, great little ditty called The Bounce Back Book, and she was kind enough to share this essay excerpted from it. If you’ve ever experienced uncertainty, setbacks and losses (if you are, in other words, a human being), and especially if you’ve lost a job recently, you’ll want to take note. 1. If you’ve just endured a career adversity, join the crowd–and by the way, it’s a very distinguished successful crowd. Many members of the Fortune 500 Club could easily earn membership in the Misfortune 500 Club. Successful people are not people who never fail. They’re people who know how to fail really, really well. If they fall on their faces, they use that leverage to push themselves up higher. Bill Gates actually relishes the lessons of failure so much, he purposefully hires people at Microsoft who have made mistakes. “It shows that they take risks,” says Gates. Harvard business school professor John Kotter says it’s more worrisome to executives if a job applicant claims they’ve never failed–because this means they’ve never taken risks. Roberto Goizueta, Coca-Cola’s CEO, says the risk-taker mentality is the very reason he hired back the guy who launched New Coke–a huge marketing failure. Goizueta recognized how you can become uncompetitive if you’re not tolerant of mistakes. In fact, if you let ‘avoiding failure’ become your motivator, you¹re going dangerously down the path of inactivity. “You can stumble only if you’re moving,” he says. So if you recently stumbled and fell in your career, re-focus on how your risky thinking makes you more knowledgeable. Own the positive lesson learned –as proof you are an outside-the-box valuable thinker. See work failure as ‘fullure’–full of many lessons. 2. Think like a lion about your firing! Graham Thomas Chipperfield, a star lion tamer with Ringling Bros. and Barnum & Bailey Circus, got bitten by Sheba, one of his 500-pound lionesses. Before the mauled Chipperfield got back into the cage, he made very sure to see what happened from Sheba’s point of view. He recognized how lions tend to think of the trainer as another lion. And so when Chipperfield bounded into the cage to help out Sheba–by breaking up a fight between her and another lion–Sheba merely figured Chipperfield wanted to join in the fight too. Did Chipperfield sit around blaming Sheba for her inaccurate thinking? No. Instead he took the time to see the biting from Sheba’s perspective, so he’d make sure this bad event would not happen again. For this reason, many therapists–beginning with Freud–have clients create a ‘mimesis’ — meaning they role-play the situation from the offending party’s perspective. The hope is that, through this mimesis role-playing, patients might better understand why someone might have emotionally taken a bite out of them, so they can avoid being bitten again! Your Assignment: If you’ve been fired, rejected, yelled at– any/all of that — take the time today to try to see things from ‘Sheba’s Point of View’ so you can perhaps avoid being fired – rejected — yelled out again. Plus this exercise will help you lessen your anger at those Shebas in your life. 3. If you ask depressing questions, you will 100% get depressing answers. For example it does no good to ask yourself: Why didn’t I … ? What if . ..? Why me? Would you accept some of the mean and nasty questions you ask yourself if they came from an outside source? Doubtful! So you gotta stop — and swap — immediately for these questions which bounce you upward: What can I do to move forward? How can I grow from this challenge? What¹s within my control to change? 4.Shrink negativity into nuggetivity. Limit the amount of time you allow yourself to think negative thoughts to 3-minute nuggets, three times a day. Set aside a specific time of day when you will allow yourself to think negative thoughts. Whenever a negative thought enters your head, tell yourself you can’t think about it until your preset Negativity Appointment. Who knows, maybe you won’t even want to think negatively once this time swings around. This was a timely article for me. Some close friends have been laid off or fear they are in danger of being laid off. Karen’s book will likely be a positive force in their life. Likewise, I am a big fan of Roberto Goizueta, and my ears (and eyes, I guess, when you are reading) always perk up when I see people quoting him!